Millard Fuller appeared to be living everyone’s dream. He was a millionaire by age 29, and had just about anything money could buy. However, he wasn’t happy. He was consumed by work and material possessions. His life hit rock bottom when his wife was ready to divorce him. Fortunately, Fuller and his wife reconciled, and together they decided to make some major changes in their lives. They sold all their possessions and gave their money to the poor. 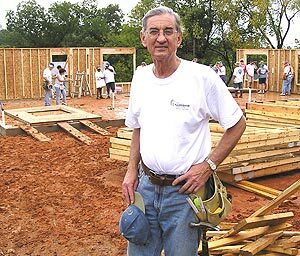 Fuller later founded Habitat for Humanity International, a Christian non-profit organization that builds affordable houses for lower-income families. That happens to a lot of us. Some people get to the point where they realize they have to make some radical changes in their lives. It’s good to know that, no matter how far off course we have strayed, we can always start over again. This entry was posted in Christian Living, Communion Meditations, Leadership and tagged giving to the poor, Habitat for Humanity, illustration, life change, Millard Fuller, repentance, second chance, starting over. Bookmark the permalink. Thank God for second, third, and fourth… chances! Seems I have to take advantage of those more often than others. So glad that God loves knotheads, too!